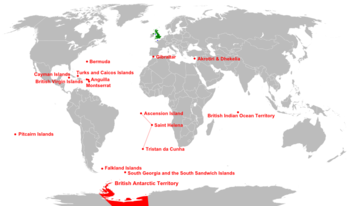 ↑ "[ARCHIVED CONTENT] UK Overseas Territories Foreign & Commonwealth Office". Collections.europarchive.org. สืบค้นเมื่อ 2010-12-08. ↑ 2.0 2.1 "British Antarctic Territory". Jncc.gov.uk. สืบค้นเมื่อ 2010-12-08. ↑ "Commonwealth Secretariat - Anguilla". Thecommonwealth.org. สืบค้นเมื่อ 2010-12-08. ↑ 4.0 4.1 "UNdata | record view | Surface area in km2". Data.un.org. 2009-11-04. สืบค้นเมื่อ 2010-12-08. ↑ "Bermuda". Jncc.gov.uk. สืบค้นเมื่อ 2010-12-08. ↑ "Commonwealth Secretariat - British Antarctic Territory". Thecommonwealth.org. สืบค้นเมื่อ 2010-12-08. ↑ "British Indian Ocean Territory". Jncc.gov.uk. สืบค้นเมื่อ 2010-12-08. ↑ "Commonwealth Secretariat - British Indian Ocean Territory". Thecommonwealth.org. สืบค้นเมื่อ 2010-12-08. ↑ 9.0 9.1 "British Virgin Islands (BVI)". Jncc.gov.uk. สืบค้นเมื่อ 2010-12-08. ↑ 10.0 10.1 "Cayman Islands". Jncc.gov.uk. สืบค้นเมื่อ 2010-12-08. ↑ "Commonwealth Secretariat - Falkland Islands". Thecommonwealth.org. 1982-06-14. สืบค้นเมื่อ 2010-12-08. ↑ "Gibraltar". Jncc.gov.uk. สืบค้นเมื่อ 2010-12-08. ↑ "Commonwealth Secretariat - Gibraltar". Thecommonwealth.org. 2002-11-07. สืบค้นเมื่อ 2010-12-08. ↑ 14.0 14.1 "Montserrat". Jncc.gov.uk. สืบค้นเมื่อ 2010-12-08. ↑ "Pitcairn Island". Jncc.gov.uk. สืบค้นเมื่อ 2010-12-08. ↑ "Commonwealth Secretariat - Pitcairn Islands (Pitcairn, Henderson, Ducie and Oeno Islands)". Thecommonwealth.org. สืบค้นเมื่อ 2010-12-08. ↑ "UN Statistics - St Helena census 2008" (PDF). unstats.un.org. สืบค้นเมื่อ 2011-01-04. ↑ "Territories: St Helena, Ascension, Tristan da Cunha". bbc.co.uk. 2010-12-01. สืบค้นเมื่อ 2011-01-04. ↑ "Population of Grytviken, South Georgia and the South Sandwich Islands". Population.mongabay.com. 2009-03-31. สืบค้นเมื่อ 2010-12-08. ↑ "SBA Cyprus". Jncc.gov.uk. สืบค้นเมื่อ 2010-12-08. ↑ 22.0 22.1 "Turks and Caicos Islands". Jncc.gov.uk. 2009-11-01. สืบค้นเมื่อ 2010-12-08.